I find indoor photography much harder to do than outdoor photography. I’m not sure why. Maybe it’s all the prep work. Setting up the tripod, finding the correct amount of lighting, getting the proper backdrop, and de-terming the proper depth of field. Most of my indoor photography is step-by-step fly patterns. Like the Russ Maddin South Bound Trucker that is on display above. Where I shoot most my outdoor photography free hand, and the mistakes that I make outside I can blame on mother nature, moving boat, or unhappy fish. Where I find I have less excuses with indoor. When a photo goes bad it’s on me. I’m also more critical of my indoor photography. Are the colors coming out, did I capture what the fly tier was creating. As I continue to build my studio and purchase additional products to help with backdrops and lighting, I know I will capture better images. Until then, enjoy some of the patterns, and hope they help you catch more fish. Additional patterns can be found at the Hawkins Outfitters Articles page. When the news came out that new regulations from the State of Michigan were coming out in 2011, I was very supportive of the changes made to opening additional sections to help spread out the angling pressure. On April 1st, 2011 from M-72 to Lake Michigan on the Manistee River will now remain open year round. Providing anglers with the opportunity to fish these waters whenever the calling comes. Yesterday when the day finally arrived. First time since 1910 that the Manistee has been open in these sections. Russ Maddin and I jumped in the boat with Erik Crissman from the DNRE and floated a section of water that just opened. Russ as he usually does showed Erik and I how to do it, with a nice fully grown female brown trout. If you have not fished with Russ or tried to tie some of his innovative streamers, you owe it to yourself. 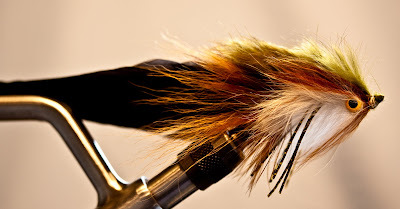 One of Russ’s signature patterns is the Mad Pup, check out at the Hawkins Outfitters page and tie some up. 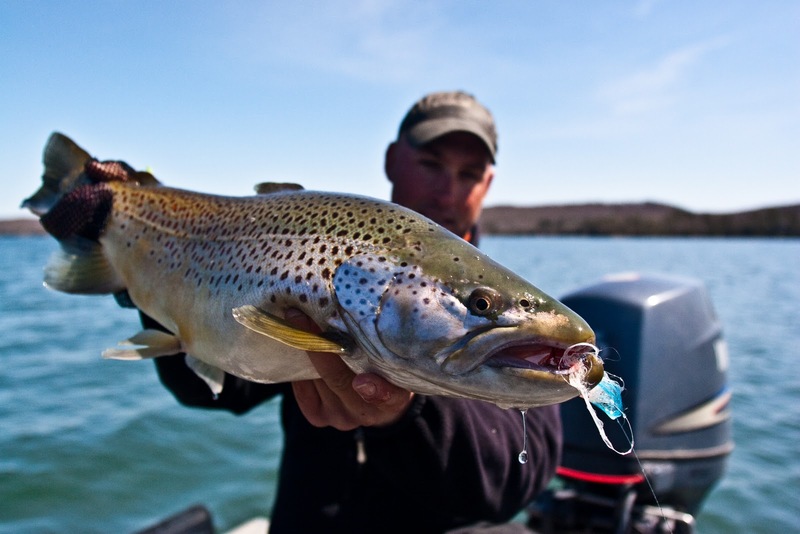 For additional information about the new trout regulations go to the State website or pick up the new regulations when you buy your 2011 fishing license at your local fishing tackle locations. Is there a more aggressive fish than a pike? I’m not sure, but this photo is why I named my website Mangled Fly. I love it when a fish destroys a fly that took me 15 minutes to tie! 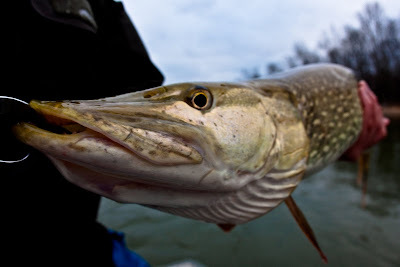 Ice out pike fishing is game on right now, if you want to try something different go hunt these toothy creators. 8″ Dalhberg Diver will never be the same! http://mangledfly.com/wp-content/uploads/2014/07/logo.png 0 0 Jon Ray http://mangledfly.com/wp-content/uploads/2014/07/logo.png Jon Ray2011-03-22 13:23:002011-03-22 13:23:00Love how they Eat the Fly! 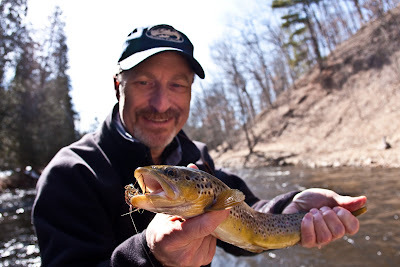 Spring Time Brings so many different Fly-Fishing Opportunities! After spending the past 3 plus months under mounds of snow and inches of ice, spring time has officially started! Now some of the hardest decisions await the fly-fishing angler. What to fish for? Spring time brings us many different opportunities and currently most are in full steam! 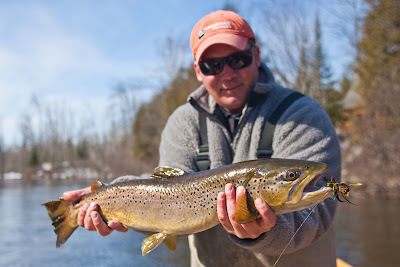 Early Season Brown Trout Fishing, after a long winter brown trout are looking to put on the feed bag. 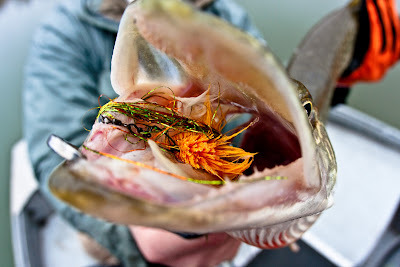 Streamer fishing is the most talked about way, as the hunt for the big boyz with big streamers gets allot of the attention. But dry fly fishing early black stones, hendricksons, and midges on the right day can be fun early season. Nymphing egg patterns or fry patterns can yield plenty of results as well, both on rivers with or without steelhead present. Ice Out Pike, first I have to be honest with this one. 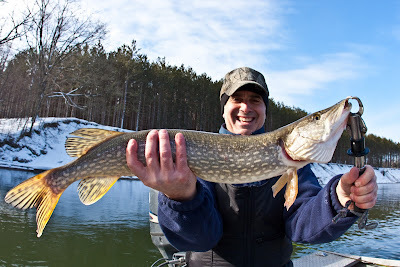 I do not have allot of experience hunting early season pike. But I have found a little jewel and sharing the knowledge that I’m learning with my clients. If you like these toothy creatures now is the time. Smaller males are grouped up in packs awaiting the big girls. I have spent very little time on the Big Manistee looking for these predators, but have been amazed how many I have found so far. Will share this knowledge after the season, as fly patterns and technique are being formulated. Spring Steelhead, while steelhead have been here all fall and winter (and I personally think fish better than spring), the weather has finally broken, water tables rise, and fellow fisherman fill the river. With all this certain areas are plugged with boats and shoreline anglers. I have challenged myself to go away from the norm and take my skills else where. With a mixture of float fishing and streamers, fresh run spring fish and drop backs will keep me plenty busy and way from congestion of spring traffic. If you have not focused on drop back fish, your missing something special, they are just as aggressive as fall run fish and will crush the first meal they see. If you have ever fished with me before, you know I love dumb fish. So January and February are for the most part a michigan fishing guides off season. Besides breaking down the rivers and learning new spots for the up coming spring run, or tying a couple hundred more flies. I’ll try to venture out on the ice a few times a season on the vast amount of inland lakes. Living in northern michigan, more lakes than I previously thought are stocked with trout. I have to be honest, I am way more adept at reading a river than I am a lake. But with the use of a couple maps and a Vexliar getting my bearings on the breaks and drop-offs is not that hard. Also with the added benefits of having a good friend and ice fishing master in Russ Maddin showing you a couple hot spots helps too. The key reason for venturing out on the ice this time of year is to have those bearings for when the ice out occurs. As you can argue my next point all you want, but it’s the honest truth. 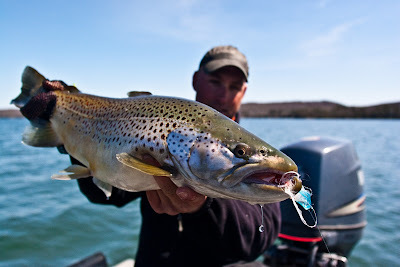 If you are a big trout chaser, the biggest brown, rainbow, or laker trout are going to come from a lake. This light-bulb was turned on after reading Bernie Taylor’s book 5 years ago. Example is the world record brown trout caught a few years ago from the Manistee River. This was not a river trout, it was a lake-run brown that ventured up the river. Big trout meaning trout over 10 pounds, get big in a lake not a river. Trout that live in a lake can eat and be lazy, while a river trout has to keep battling current. With so many inland lakes being stocked with trout (browns, rainbows, and lake trout) the fly angler has a great opportunity to target these trout in the spring after ice out. All three species are going to be looking for that warmer water in the spring, and most days this warmer water is shallow. Perfect for the fly angler! Thermal warming from the sun brings the bait-fish shallow, and if you can find the bait-fish you will find the predator’s that hunt them. Now how I use the ice, is when you can’t find these trout shallow, you have to know where to find them when they go deep. Just like in a river their are certain hunting grounds that hold fish. Being able to find these hunting grounds with a foot of ice underneath you will give you a head start for the upcoming spring melt. Michigan anglers have so many opportunities, getting out and finding them is the fun part. Fishing today on the Manistee River was highlighted by one of my favorite birds the Bald Eagle. 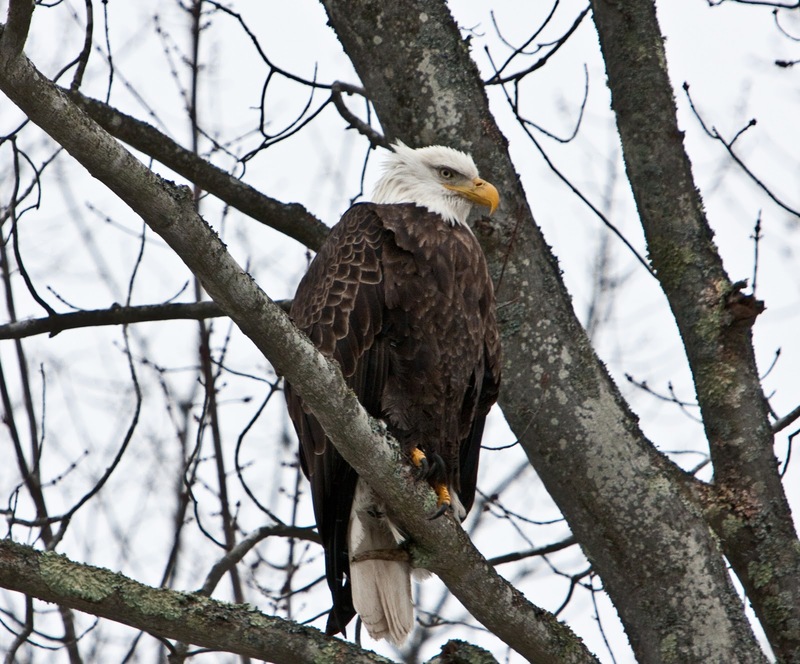 We had the opportunity to witness a handful of different eagles fly around, over, and perch next to us as we floated down the Manistee River. 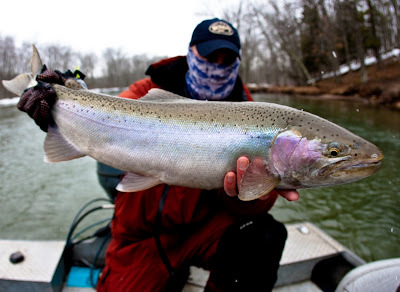 While winter steelhead fishing is most likely the most overlooked time of year for anglers to hit the river, as you have read before is one of my favorite times of year to fish! 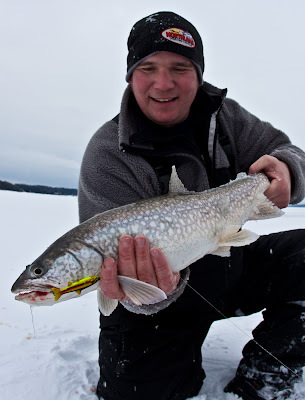 As I have mentioned in previous blog posts winter fishing has a special place in my heart. The wildlife runs abundant, most likely because their are less anglers present. But also because the river gives life. Deer use the river as their primary source for drinking water, as it’s one of the only places to find unfrozen water. Ducks, geese, and swans need open water to feed and to hide from predators. But predators or scavengers hunt the river banks looking for an easy meal, as winter is not for the weak. Now with all this wildlife using this corridor in a mixture of ways, when floating down the river you have an opportunity to see nature in it’s true setting. I can’t say every-time I venture out in the winter I see wildlife like today. But the days I don’t see this, it has my attention. I then start to wonder what is going on. What has mother natures attention? Is their a storm on the way, what does Barometric pressure do to wildlife? 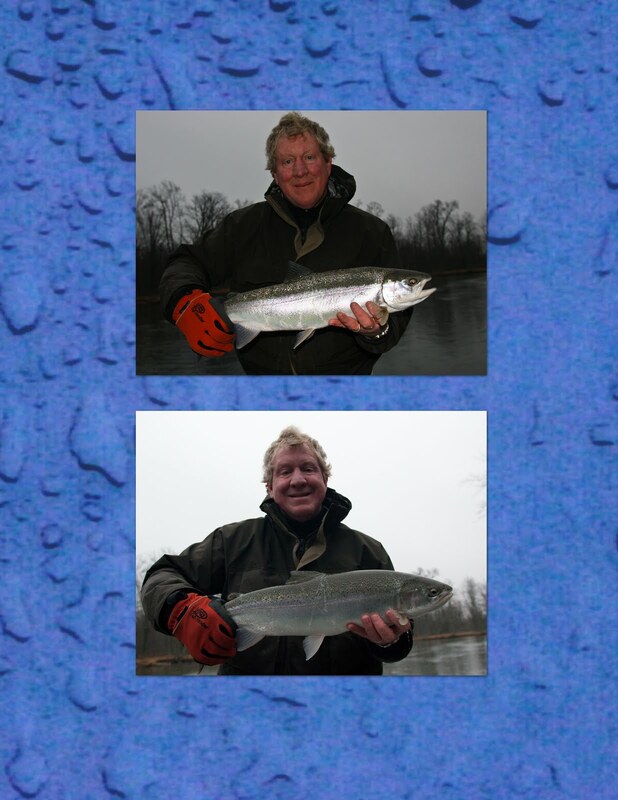 Then the correlation between mother natures wildlife and my steelhead starts to take shape. Now this is unproven but it’s amazing to watch how it’s all related. Put it simply, when birds, deer, turkeys, and eagles are moving so are the fish! If you love wildlife and you love a little steelhead along the way, nothing beats winter fishing. Still plenty of weeks left before the crowds start to show. Feel free to contact me via email at jray@hawkinsflyfishing.com for open dates. P.S. We found a nice batch of steelhead today as well, but the eagles still made the day! Have some things on the radar that I’m pretty excited about, don’t want to spoil the surprise but deals with the world of underwater. I shot this little underwater video above, about a month ago, that honestly took about 5 seconds to do. I came home from this little test shoot and started to think that if I put some serious time into setup what else could one do???? The HD Pro is a cool little toy and the quality that you get from the camera for the size is pretty amazing. Also take a second and check out HD Pro’s youtube page to watch some crazy skiers and snowboard’s do what they do best. Since I spend most of my time above the water, I can’t wait to see what I learn when I take the HD Pro below the surface. HD Pro has dozens of mounts that you can use so getting some unique shots and angles, this going to be fun. Check back in a few months to hopefully see some new videos. I’ll try to keep you posted on the events with some small clips. For the most part working outside during the day I can use natural light. I am not a fan of flash photography. But there comes a time and a place for flash. Flash can be a creative tool. Example of this are two pictures from above, both taken about 10 seconds apart. Dave S. joined me for a day of steelhead fishing, and if you steelhead fish you know early morning can be good. Well we started at 8am this past week, still a low light situation. As luck would have it on our second or third cast of the day, a playful 5-6 pound hen was twisting, turning, jumping, and running through the run we were fishing. Dave made quick work and the fish was in the net. Now comes the fun part of photography. How to take a picture with little to no light, and not have a blurry photo. Blurry photo because my shutter speed has to be longer with limited light, and since I shoot freehand when guiding, not much time to set up a tripod. The bottom picture I had to get my ISO up to 1600 to get any-sort of picture, but quickly taking the pic and looking into the LCD I was not happy. My natural light limited and my ISO was really not high enough, but was max out on the camera. I just was not pulling out the chrome nature of the fish. While I only currently have a pop up flash on my Canon 40d, (currently saving my pennies for the Canon Speedlite 580ex II) I switched to ISO 400 and shot a quick pic with the pop flash. Much better. While I still like using natural light as much as possible, I also want to get better at the art of flash photography. Hope to show more examples of this in future posts. I recently took a class in TC at the college, about using flash. Can’t wait to get the Speedlite, pretty amazing how the two (camera body and external flash) work together understanding ISO and shutter speed. Gotta love technology.